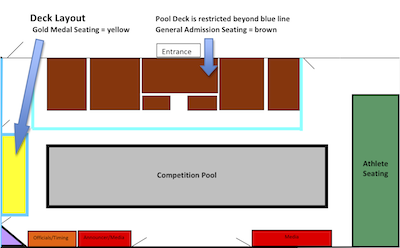 Main Bleacher General Admission Seating is unassigned, festival atmosphere, bleacher-seating – parallel to the length of the pool offering an unobstructed view of the entire 50 meter course. Gold Medal Preferred Seating is elevated, assigned chair back seating constructed behind the starting blocks. Just outside the venue, Gold Medal ticket holders can enjoy our VIP Hospitality Area, for relaxation, light complimentary refreshments, and remote viewing of the event. All-Session Tickes will go on sale February 1, 2016. Check back for sales of individual session tickets. Advance purchase of Thursday Timed Finals and Friday, Saturday and Sunday Prelims if available will be sold for $15/session or $20/session at the door. Advance purchase of Friday, Saturday and Sunday Finals if available will be sold for $20/session or $25/session at the door. Advance purchase of Thursday Timed Finals and Friday, Saturday and Sunday Prelims if available will be sold for $30/session or $40/session at the door. Advance purchase of Friday, Saturday and Sunday Finals if available will be sold for $50/session or $60/session at the door.